Myrwatch is a Creation that adds a player home in Hjaalmarch. Like Tundra Homestead, it contains an area for displaying unique items. It also includes a staff enchanter from Dragonborn. It was released on August 29, 2018 for 400 CC Credits. This Creation was made by Elianora, the same author as Tundra Homestead. Myrwatch is a remote, but lavishly appointed, new player home deep in the fens of Hjaalmarch. The second floor contains a broad array of displays, allowing collectors to show off many of the unique items found across the land. More magically inclined characters will also find a rare staff enchanter here. This creation adds Myrwatch, a mage tower east of Morthal. The tower is originally locked, but can be unsealed by completing a short quest. It can then be used as a free player home. The tower comes fully-furnished and consists of two interior spaces separated by a magic portal. 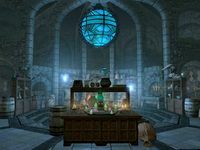 It contains many crafting stations, including an oven, a staff enchanter (the only one outside Tel Mithryn), and an "All Forge" which allows you access to crafting options usually exclusively available at the Skyforge and Gunmar's forge. The property also possesses a large numbers of display cases and racks, with places to store unique artifacts and items such as dragon priest masks and bugs in a jar. A previous version of Anora's Journal made reference to the Warlock's Ring, which was supposedly stored in Myrwatch by its original inhabitants. However, the ring cannot be found in-game, and the Creation was updated shortly after release to remove all mention of it.